Tiny living is a non-stop trend these days. If you are considering going minimalist here are tiny home ideas that will surely fit the bill! If you can’t afford nor want a pristine new, five bedroom house that seizes 4,000 square feet, don’t despair! There is still a shot for you to achieve your American dream! Let me present to you 15 tiny living ideas that are very much sustainable. This is such a brilliant cottage that could make even the crankiest person smile. Situated in Vermont, the cottage is available for lease to anyone who will pay about $92 a night. It has one room with a single or double bunk, just like you find in the photos on the facilitating site and living room. Good for 5 individuals, assuming 2 of them don’t have an issue with sleeping in the living room. You can have the DIY shell unit for only $16,338 and if you live in the north-eastern part of the US you can have it shipped directly assembled for about $65,000. It measures 312 square feet and it can be customized to become energy efficient by installing proper wall insulation and solar panels for electricity. Here’s a unique design of a tiny house. The structure is basically a treehouse, the fantasy of any 7-year old. But adults will be just as delighted when they find out what’s store inside. The majority of the pieces of furniture are made of hardwood. The stairs inside will bring you to the upper level and you’ll find a bookshelf and a comfortable chair where you can have a peaceful reading or great evenings chilling with your loved ones. Depending on the complexity of the design, you can pay as little as $10,000 or as much as $50,000. Who says you can no longer practice your green thumb when going small? Well, they’re wrong! Any budding green thumb would rejoice in this beautiful tiny house with porch swing and greenhouse. It has an airy and bright living room area that fits a full-size pull-out couch and a chair. The main structure measures 323 square feet, but what really sets this little home apart from the rest is the 85 square feet greenhouse trailer attaches to the main house. This parallelepiped tiny home measures 8-foot 6-inch wide and 13-foot 5-inch tall. The house has wheels and with its size, you no longer need any transport permit if you want to hit the road. It has a master bedroom upstairs and a full-size kitchen with traditional appliances. Not just that, it also has a fully functional bathroom and lots of storage space. This plan will cost you around $300. The estimated cost of this design is at $33,000, however, if you prefer the 24-foot version you’ll need around $60,000. A home is a place of simplicity and peace and that what this toy box house embodies. Its design has a touch of modern elements combines with eco-friendly materials. The roof membrane is made of thermoplastic polyolefin (TPO) that provides an excellent energy efficiency. The walls are made of natural cedar and fiberglass. The size of its structure is flexible and its base price is $79,000. Created by Normal Projects, this spacious apartment measures only 450 square feet. The key to this space-saving innovation is a single and a larger custom cabinetry piece embedded in one wall. The cupboard is filled with the functional elements of a bigger loft including a bed, a closet, an end table, a library, a home office, kitchen storage, and the most part of the room lighting. Every component can be folded up into the wall. Here’s a wonderful conventional little house with a gable roof. Situated on a dairy farm in Northern California, this house has a wraparound patio for you to enjoy peaceful summer evenings. It’s family amicable of what it would appear on the outside as well as the inside. The white and red hues influence the house to look happy and youthful. Expect to spend about $700 for the plan and around $40,000 for its construction. The expenses differ on the kind of wood you want to utilize for the roof, walls, and deck. You’ll say the structure of this Kidd cottage seems old and flimsy. Well, 99% of the house is made of reclaimed materials, that made you right about the old part. However, some paint and a little of any designer’s creativity knows exactly how to transform this traditional home into an extraordinary abode. The house has another great story other than just being a loft. The wraparound patio provides an open space where can put some vintage furniture. The drawback there is no real bathroom or kitchen because it only measures 63 square feet. But there is a separate bathhouse where you can have a complete bathroom amenities. This adorable transforming A-frame cabin cost only $1,200. If you already have a few DIY projects hanging under your belt, I’m pretty sure you can easily rebuild this kind of little dream home. If you have some repurposed materials, such as logs, nails, boards, and window frames available from previous projects the better to help you trim down its cost. At only 102 square feet, this little house fits a bathroom, kitchen, and sleeping area. The whole house has complete off-grid amenities, roof-based solar panels and an integrated inverter and battery set. It also has a propane heater and a 100-gallon freshwater tank to ensure the residents won’t go cold or hydrated. Price starts at $36,000 and can go down on or up depending on finishes, customizations, appliances, and materials used. If you are dreaming to become a pioneer and want a home you can easily customize to suit your need and desires, Shepherd’s hut is what you’re looking for. These remarkable wooden wagons by Gute is an evidence that living off-grid can also be comfortable. The custom plan comes with handcrafted modular furniture, such as bunk bed and fold out desk. This cedar mountain tiny house may look tiny on the outside, however, the inside is big farmhouse-style. With reclaimed accessories, subway tile, shiplap walls, and sturdy hardwood floors, it’s the amazing combination of modern simplicity and rustic charm. True to its name, this 280 square feet tiny home signifies that nothing can go wrong if you use dark colors in a small room. This indigo tiny home by Driftwood Homes USA is beautified with pops of moody and dark hues. I’m sure you’ll fall in love with the kitchen – blue cabinets are paired with rustic wood. You’d better take a peak. This beautiful home is currently available for $69,500. This Scandinavian tiny house is made of black stained wood and measures 260 square feet. Upstairs, there is the room space for bed and space to hold clothes. The value begins at $74,000. By and by you see huge windows on the front of the house. It appears this is a convincing approach to draw attention far from how little the structure really is. 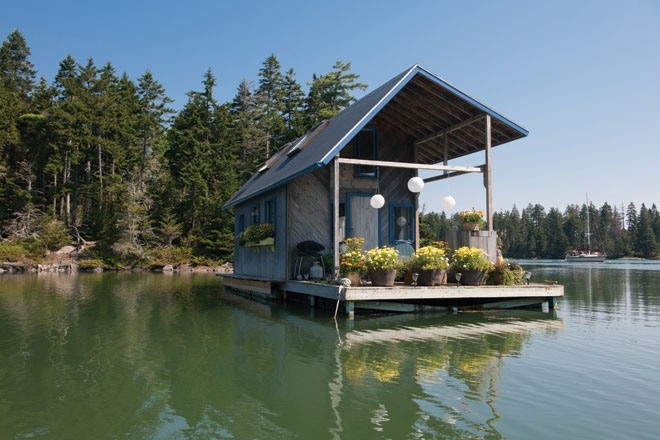 This incredible 240 square foot floating cabin is totally off the grid. It has a 55-gallon water tank that supplies to the kitchen and shower, two propane tanks to power a refrigerator and a stove to provide hot water. When the sky is dark, the cabin glows with oil lamps and candles while solar lights illuminate the platform. A family of five will probably have some difficulties living in such a small house, but these tiny living home ideas are great for young couples, singles, millennials, or even a family of four. Depending on how much space you’re willing to use for living and what your lifestyle aspirations, desires, goals, and preferences, there’s one perfect tiny home for you. I hope you find it here in this list. Which of these tiny living home ideas caught your fancy? We’re excited to know! Let us know in the comments section below.